Hi. I just wanted to say thank you to you guys for running my story, "Curse the Darkness." This is the first time one of my stories has been published online, and I'm just all kinds of honored and excited. Thank you! Randy, welcome to the 'zine, and thanks for joining. I have a feeling you'll have some entertaining and interesting input. Nice that you're jazzed about seeing your story here. Hope you still feel as enthused when I'm done critiquing it, LOL! Welcome to Aphelion Randy. I glad that one of your story got published here at Aphelion, and I'm sure it will be the start of a long list of your stories here and at other 'zines. Yeah, I'm very much looking forward to feedback on the story from your readers. 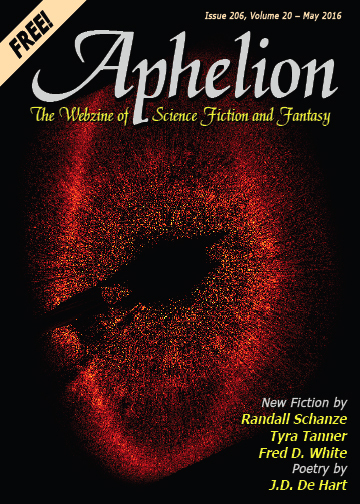 Hi to all the Aphelion readers and writers and thanx to the A-team for selecting my story for publication. And sorry for my english. Hope you enjoy the story.